The Classic Watch sample application demonstrates how to implement the Tizen official classic watch face application. 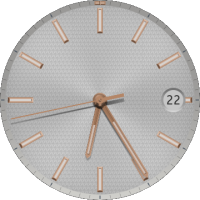 The following figure illustrates the main screen of the Classic Watch application. Set styles for the watch face hands in the style.css file as well. Define a method for rotating the elements with a specific class name. It is used to rotate the hand elements. Add an event listener for the visibilitychange to update the screen immediately when the device wakes up. Add the setTimezoneChangeListener() method of the Tizen Time API to update the screen when the time zone is changed.